First a little history lesson, The Radnorshire Railway Bill of 1865 proposed extending the line from Presteign onward to Llangunllo, where it would have joined the Central Wales line. Once on those metals trains from Titley Junction would have continued along the line to Llandinam, where they would have joined the Cambrian. Alas that particular Bill was withdrawn but the Lugg Valley Railway Bill for a similar line did receive Royal Assent, but it was never implemented. In 1923 the whole idea was raised again, but with a junction with the Central Wales Line being made at Llanbister Road, however nothing became of that either. Both bills were actually proposed and are not a figment of my imagination, that will come into play later. In the meantime let us return to Titley Junction, where trains for Presteign began the 7 mile journey up the Lugg Valley, well 7 miles 38 chains to be precise. On leaving Titley the branch ran parallel to the Leominster line before swinging away to the left. After travelling a further 3 miles Forge Crossing Halt was reached, which was the only intermediate stop on the line. The Halt comprised a simple wooden platform, what I can only assume to have been a plate layers hut, and a crossing keepers cottage. Today the cottage, like many other old railway buildings along the line has been converted into private dwelling. Despite its short length the branch featured some notable civil engineering works. Steep gradients were many, the most severe being 1 in 43. There were several cuttings as well, the one at Roddhurst being the longest, and deepest. At Wegnall the line had to be carried across the Hindwell, and Back Brock flood plain on a high embankment. There were also many culverts, and bridges, the one at Forge Crossing over the River Arrow, perhaps being the best known, for it collapsed in 1874 before the line was even opened, and had to be rebuilt thus delaying the opening of the line until the 9th September 1875. The original plans called for Presteign station to be built on the outskirts of the town, but the line was extended by a further ½ mile to terminate in its centre. No doubt the lessons of New Radnor had been learned, where the station stood in splendid isolation, and some distance from the town it served. I have read of plans for a distillery at Presteign, but nothing came of them. The layout of the station was typical of many country branch termini, the large goods shed was at one time rented by the Old Radnor Trading Company. Who had premises throughout the area. The station building at Presteign differed from others on the line, and like those at Eardisley, Lyonshall, and Almeley, no living quarters were provided for the station master. Built to a design by William Clarke, the building at Presteign was constructed from Nash, and Bath stone. Originally built with a canopy, the latter was removed, a fate shared with many other buildings by Clarke of the same design. In some cases the canopies were cut back, it has been suggested that the buildings shared a structural weakness that made such action necessary. This is the original Llangunllo station building, though modelled on the one at Portesham, which was also designed by William Clarke, it is similar to the building at Presteign. My thinking at the time, was that other station buildings along the proposed line would have been to the same design. Looking back perhaps the building was too grand for such a desolate location as Llangunllo. By 1936 there were only three passenger trains in each direction daily, two being mixed. After 1945 passenger trains were reduced to two each day, except on Saturdays when there were three, and no trains ran on Sundays. Goods trains ran everyday until the last years of the lines existence, when only two ran a week, and finally as required. In my minds eye, I imagine the railway looking something like the plan above. 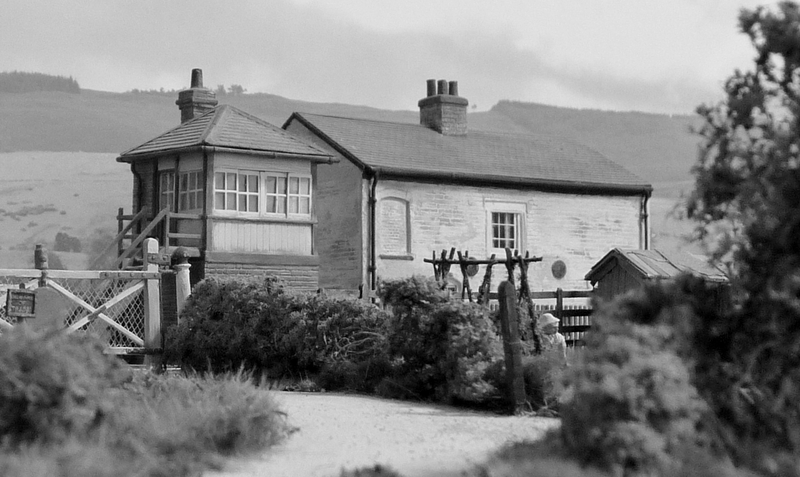 The next idea is to model Llanbister Road engine shed, and a scene inspired by Talybont on Usk. However both will be simple dioramas, and though trains will be able to run through them, they will not be physically connected to Llangunllo. When I originally took the liberty of extending the branch onward in model form, I had no idea that such a proposal had been planned. So I was pleasantly surprised to find my ideas weren’t far off the mark, and not as far fetched as they might have first appeared. For me the beauty of modelling a might have been railway is the freedom to model anything I like within reason, just as long as it has a Welsh Marches flavour, and fits into the scene that I’m trying to create. The same applies to the trains, it might well be a sleepy branch line, but the real thing could have seen the odd diversion, or excursion and so it is on the model. Since I drew this plan, which was inspired by the arrangement at Kington, I’ve been thinking of of changing things, for having a bridge and level crossing so close together just doesn’t make sense, or look right. So I thought why not model an occupation crossing instead, with just a simple set of five bar gates being provided to protect a cart track leading to neighbouring farms and land? Another idea is to replace the bridge with the level crossing, the cottages would be moved from one end of the scene to the other. A group of trees then being planted them to act as a view blocker. The shed and its entry would also be changed. The line would enter a shallow tree lined cutting at the opposite end of the diorama to act as another view blocker. Having given the various ideas plenty of thought, I am now coming around to going down this route. Planning exercises like this, are for me, an enjoyable, and essential part of the hobby. The next stage of the project is to model the engine shed diorama, for which plans have already been drawn up, track templates printed and the single point 90% completed. As to whether an engine shed would have been provided I wouldn’t know. But with an almost continuous climb up the valley from Titley Junction, I’m pretty sure that watering and coaling facilities would have been needed, so why not a shed as well? The resulting diorama will take my ‘less is more’ ideas even further, there being only one point leading into the shed, and a trap to prevent any runaways from fouling the main line. If you think that’s pushing things too far, then the second diorama will be an exercise in landscape modelling, featuring just a length of plain track. However I’m hopeful the setting will make up for the simplicity, and present some interesting photo opportunities. This rough sketch was inspired by Ben Ashworth’s lovely photo of an ‘8750’ Pannier tank climbing up through Talybont On Usk with a short goods train. Its the sort of scene that appeals to me, though I wouldn’t want to model it accurately. For instance instead of the Brecknock Canal, my old friend the River Lugg would meander through the scene. Rather than model the White Hart Inn, I have my eyes set on a public house at the top of the lane where we live. Which is equally attractive but will give me a little more creative freedom. Well that is how I see the Lugg Valley extension, whether it would have turned out like that we will never know. It is certainly possible, and best of all there’s nobody out there who can say that I got it all wrong.